I started a Pin Board called "My Fave Supplies" where I am repinning journal spreads I have created using the journaling staples I have blogged about. In the description section of each photo I note WHAT fave supply is being used. I will continue to add to it as I create new spreads, or stumble upon on on pinterest that applies. If you purchased one of my Journaling Faves Packets you may find it very helpful to see how I use the things I included in the packet. Click here to read what I included in the journaling faves packets (photo below). 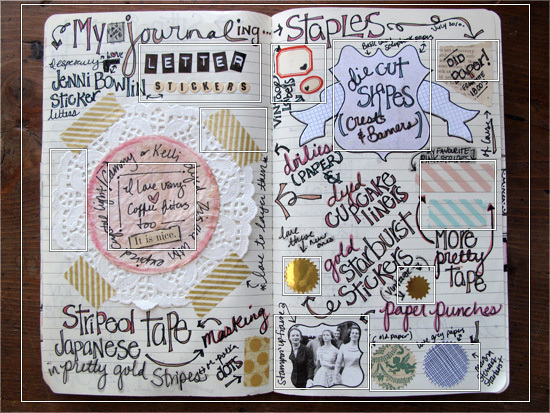 Click here to read my Journaling Staples post from July 2010 (photo below). Click here to read my Journaling Staples post from May 2013 (photo below).